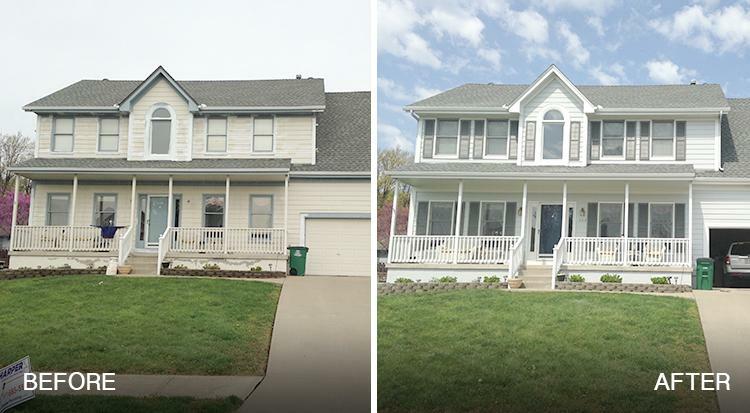 Spring is the perfect time to not only declutter your home but revamp your exterior house paint. If you’re thinking about refreshing your exterior paint colors for spring, you’re probably wondering which colors are right for your house. From neutrals, to warm hues, to trendy and classic shades, it can be confusing when trying to decide on the perfect color. The following exterior paint color suggestions for spring are sure to help you narrow down your choices so you can select the best colors for your home. If you feel that your home would lend itself well to an updated neutral in the springtime, painting your house exterior greige can be a safe yet contemporary option. While some gray or beige hues may look cold or drab, greige can help solve these issues while keeping up with your neutral color palette. Simply put, greige paint is a blend of gray and beige that offers a richer color than gray or beige alone. When blended perfectly, these two hues can complement both cool or warm neutral color schemes while looking both stylish and inviting. Greige Paint Tip! A cool greige will complement cooler trim colors like blues and whites. A warmer greige will complement warmer trim colors such as oranges and yellows. 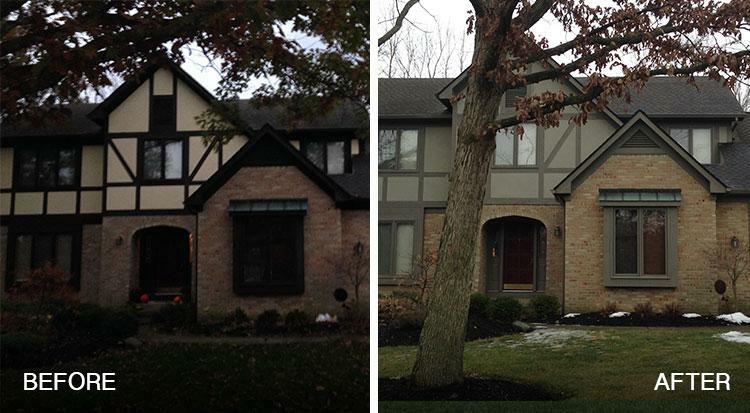 Exterior browns are hot with homeowners right now and for good reason. The right brown hue paired with brighter trim elements can lend a classic look to your home that will please your neighbors and potential homebuyers alike. Try pairing brown siding with white trim for a classic look that will look great in the spring and stand the test of time. You can also pair dark brown trim elements with a lighter brown on your house siding (or even a warm greige) to brighten up your home exterior. Brown Paint Tip! Brown exterior paint can be ideal for homes that are surrounded by natural elements such as sand, rich soil, trees, and stone. Whether you’re thinking about putting your home on the market this spring, or simply want to brighten up your home exterior, you can never go wrong with white. The trick is to choose white exterior paint that has the right undertones. Your chosen white should be on the warmer side as to not look too stark, and the undertones must complement the trim elements on your home. White Paint Tip! White looks great with subtle pops of color — especially in the spring! Consider making your front door a focal point by painting it a brighter blue, green, or red. This will add an interesting, fun element to your home exterior. If you’re looking to add some springtime cheeriness to your home exterior, a soft or buttery yellow can truly make your home stand out — without going overboard. If the yellow is too bright, it will be overpowering, so a less saturated hue will usually work best for most homes. Yellow Paint Tip! 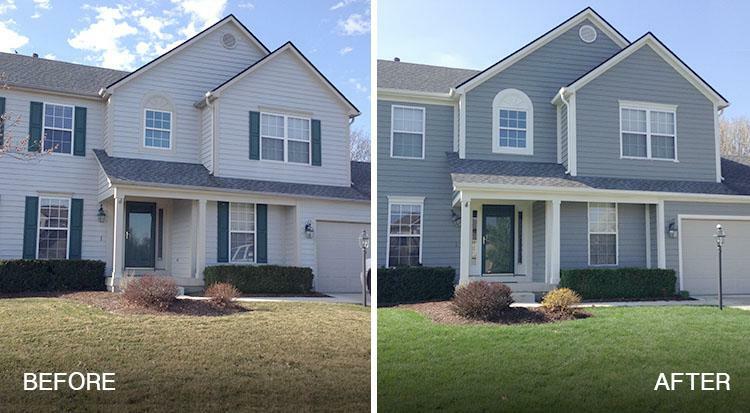 Add some contrast to your home by painting your shutters a complementary green or black, and your trim white. If you love green, you’re in luck! Green and olive houses are all the rage and can be ideal when a complementary hue is chosen. For example, if your home sits within a woodsy landscape, a light sage or other earthy green shade can look perfect. And if you have a Colonial or Victorian house on your hands, a dark forest green is a beautiful and traditional color for exterior trim and shutters. Green Paint Tip! Masonry and brick can be softened with lighter shades of green on shutters and other exterior trim elements. Blue is a universally-loved color that lends itself nicely to home exteriors. Depending on your environment, a lighter blue or even a dark navy on your siding can make your home look especially inviting this spring. Light blue will add some brightness to your home and make a small house look larger, while a navy or dark blue home will look especially elegant on a larger home. Blue Paint Tip! Light blue colors are ideal for warmer climates since they won’t fade too quickly in the sunshine. On the flip side, if you live in a mild or cooler climate, navy can often be a perfect blue hue. 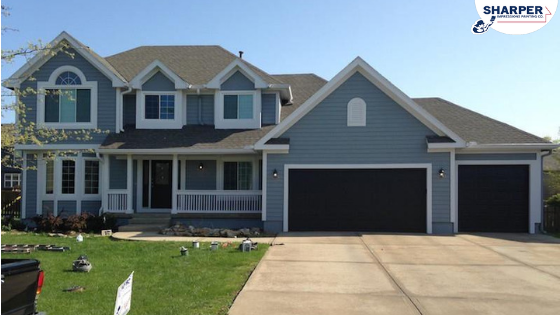 How Do I Choose Exterior Paint Colors? Before professional painters begin your spring exterior painting project, it’s important to adhere to the following paint color selection guidelines. Doing so will ensure that your chosen colors are ideal for your neighborhood, home style, and landscaping. Check with your neighbors or HOA. If there is a common color scheme going on throughout your neighborhood, you belong to a homeowner’s association (HOA), or your home needs to adhere to historical bylaws, you may be limited when it comes to your house paint color choices. Know your goals. Are you thinking about putting your home on the market this spring? If so, classic, neutral exterior paint colors are typically more appealing to potential homebuyers. Pay attention to permanent accents. Are there colors on your home that can’t be changed? Things like slate, brick, and shingles can either complement or clash with certain hues. Take stock of your landscape. Your home’s natural surroundings can provide ample clues as to which exterior paint color will look perfect on your house in the spring and throughout the year. If a lot of trees are on your property, you should be mindful of the colors of the leaves during seasonal changes. Consult a paint color expert. Working with a high-quality house painting company will allow you a free paint color consultation with a professional in-home color consultant. A consultant will come to your home and offer expert advice to help you choose the best exterior paint colors for your spring house painting project. Get your house digitally painted. A great painting company will have the software to digitally-paint the front of your house with a plethora of new colors you select. You will be able to view it on your computer or print it out for reference. This will allow you to see exactly how your new color change will look before a brush even touches your house. 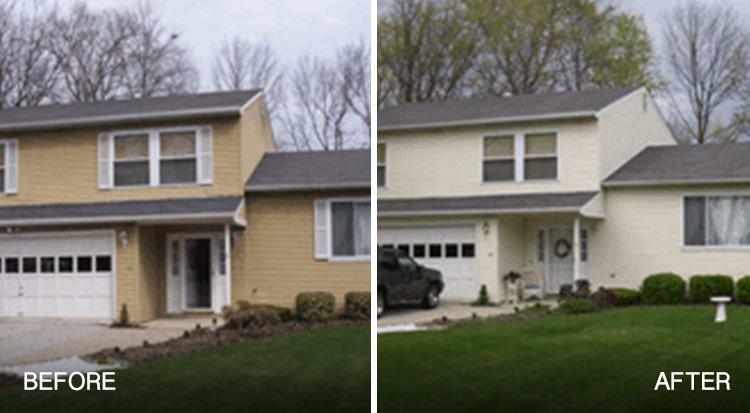 Is your home ready for a springtime repaint? Our professional painters take the worry out of doing the work yourself. We offer a variety of exterior painting services to fit your every need, including free paint color consultations to help you choose the perfect colors. 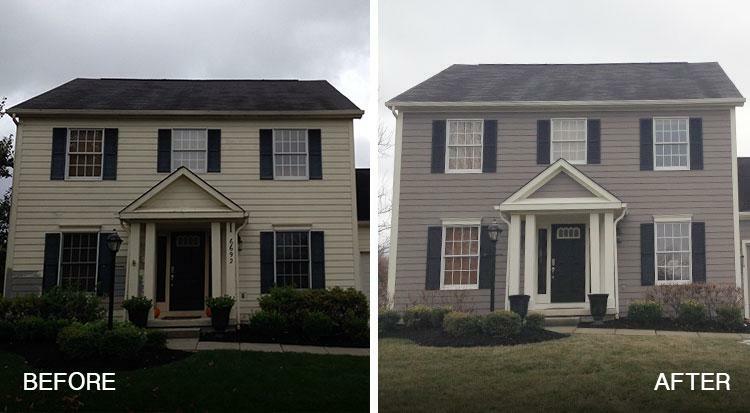 Get your free exterior painting quote today!